Longtime Legends MMA members Dustin Mueller, Mike Orlandella, and Lawrence Tsang all crossed the “Throwdown Threshold” last month, competing in an amateur Pankration event. To boot, all three did so in victorious fashion, with Mueller and Tsang winning by unanimous decision, while Orlandella secured a kimura armbar for a second round submission. “All three have been with me for a long time,” said Legends trainer Amir Rahnavardi, who has coached the trio since their first classes at Legends. Tsang, wrestled in high school, found his pre-fight techniques as a fundamental key to getting the upper hand before even stepping into the ring. “Lawrence is cool as steel. You could tell he’s competed his whole life. The other coach . . . comes up to me, he said ‘dude, there’s something up with that guy, bro. He’s way too relaxed’. . . He’s smiling and having a good time and walking around. Like you’d never think this guy is gonna fight right now and it’s his first fight,” explained Rahnavardi. “I just remembered from wrestling [that] the key was to stay calm. Because that’s the biggest mistake, is if you get all worked up, get your adrenaline pumping, when you get into the ring, you’re already warn out. You get tired out already. I tried to stay as calm as possible. . . I was also trying to intimidate, just by acting. . . That’s part of the fight, right? Just intimidate the other person, then you won’t have to fight, right?” said Tsang. "Kung Fu Mike" Orlandella lands a side kick on his opponent. Orlandella and his opponent, identified as “Nadir,” circled and traded cautious but powerful kicks during the first round. In round two, business quickly picked up, as the two exchanged kicks almost immediately. As Nadir charged in with a combination, Orlandella reached for a takedown and took it to the ground, quickly securing side mount. Nadir muted Orlandella’s offense with half-guard, but the Legends’ fighter peppered him with body shots before sinking in a kimura on the left arm, rolling through and wrenching hard for a quick tapout. The last Legends rep of the night was Dustin Mueller, whom Rahnavardi anointed Legends’ “Biggest Loser,” referring to his athletic makeover. Trimming down from a chubby 230 lbs. 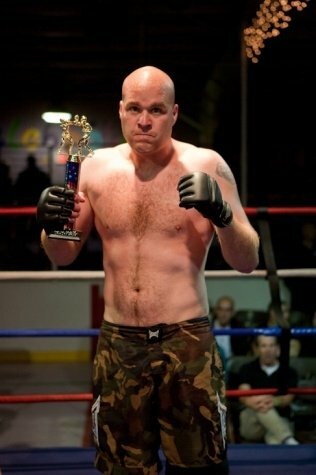 when he first joined the gym, Mueller fought at light heavyweight (205 lbs), facing a significant weight and experience advantage. Dustin Mueller after winning his debut match. 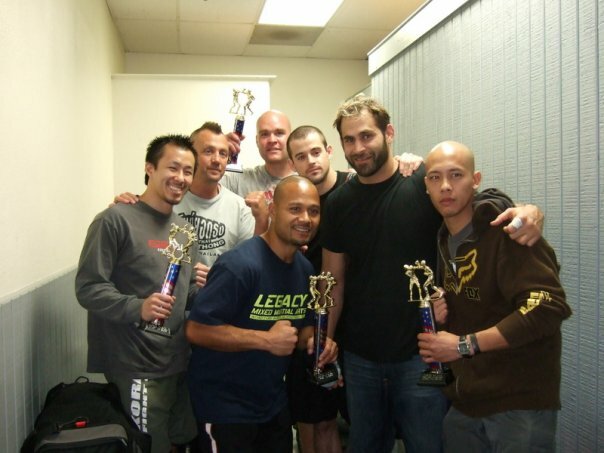 This entry was posted on December 14, 2009 at 10:02 am and is filed under Legends MMA, Live Event Reports with tags amateur mixed martial arts, amateur mma, Amir Rahnavardi, Dustin Mueller, Kung Fu, Kung Fu Mike, Lawrence Tsang, Legends MMA, Mike Orlandella, Nadir, pankration. You can follow any responses to this entry through the RSS 2.0 feed. You can leave a response, or trackback from your own site.